Tapbots, the developer behind the increasingly popular Tweetbot Twitter application, has launched a fresh update for its iOS app. Besides landscape viewing and a number of bug fixes, the update additionally includes the ability to utilize your CloudApp account. 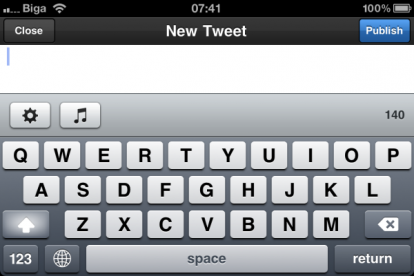 One of Tweetbot’s most annoying irritations was its inability to orientate to landscape mode in order to compose and view tweets, profiles, and media content. The latest update introduces landscape support for all of the above. Additionally, when composing a tweet, users can now add a hashtag or user reference with the addition of dedicated buttons, showcased within the “compose toolbar”. The app also offers improved accuracy when it comes to displayed locations and now supports logging in using both usernames and email addresses. With revitalized CloudApp support, ‘Tweetbot’ users can now utilize their CloudApp accounts that were limited to the Mac, keeping users in control over all shared content. Multiple bug fixes included in the update also contribute to a more streamlined, fluent experience.